Two rival regional dailies have united to back a campaign aimed at giving positive publicity to a town made the subject of a controversial television programme. Both the Northern Echo and Teesside Evening Gazette have given their backing to the scheme promoting Stockton-on-Tees, which will be featured in the second series of Channel 4 show Benefits Street next year. 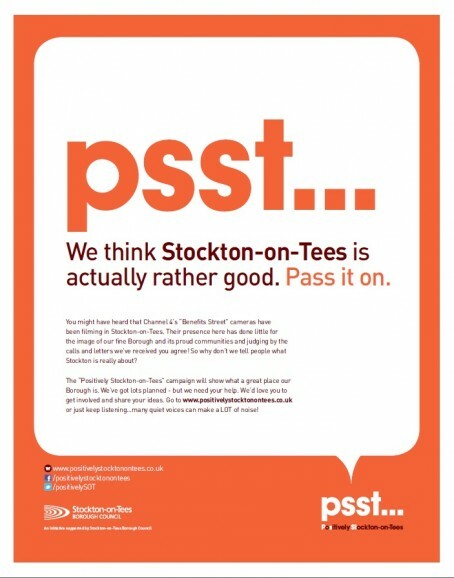 The Positively Stockton-on-Tees (Psst) campaign, supported by both the Darlington-based Echo and Middlesbrough-based Gazette, is described as “a light-hearted response” to what is expected to be a less than flattering portrayal of Stockton when the series airs next year. The campaign has been launched by Stockton Borough Council with the input of both editors, the Echo’s Peter Barron and the Gazette’s Chris Styles, along with representatives from BBC Tees and the local community. Hailing the initiative, Peter wrote on his blog: “The local authority might have wallowed in self-pity and moaned and groaned about the coverage given to Benefits Street by the local papers, and how it was damaging the perception of the area. He added: “Of course, it helps that the local media will benefit to a small extent commercially from the marketing of the campaign but, that aside, I would be naturally inclined to support it because countering the stereotyping of Benefits Street is the right thing to do. Events being planned for the campaign include the town holding the world’s largest game of Chinese whispers in March, in a bid to highlight how easily words can be mishandled. Chris said: “After we broke the story that the second series of Benefits Street was being filmed in Kingston Road (in Stockton) the response from the majority of our readers was that they did not want their area to be featured. “We covered the reaction from residents, politicians and community leaders at some length and had started thinking about positive ways in which we could report on Teesside’s involvement when Benefits Street is broadcast next year. “So when Stockton Council approached us with the authority’s own – very innovative – ideas we were glad of the opportunity to get involved. Peter’s full blog can be viewed here. Just goes to show what a bit of joined up thinking can achieve. The local Council should be congratulated for winning over the local papers with a clever mix of positive action and commercial support. A good idea and others might like to follow. But, nonetheless Stockton is a bit crappy – however it is spun and talked up.